Enjoying a sunrise on Jupiter would be a very different experience to that of Earth. For one thing, dawn comes along every 10 hours, rather than every 24. It would also be spectacularly dangerous, as Jupiter's radiation belts are about a million times stronger than those of Earth. But when the Sun's weak light penetrates the gas giant's thick atmosphere, it's no doubt a similarly beautiful experience - and we can get a glimpse of that beauty in the first photo sent back by Nasa's Juno probe since it arrived last week in the orbit of Jupiter. In it, you can see the sunlit portion of the planet, complete with the Great Red Spot, a hurricane about three times the size of our planet. On the right side of the photo, you can see three of the planet's four major moons - Io, Europa and Ganymede. The fourth moon, Callisto, is out of shot. 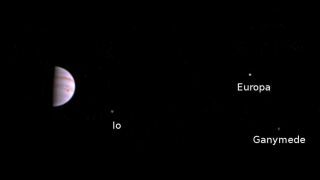 The image was taken on Sunday from a distance of 4.3 million kilometres, as part of scheduled testing of all of Juno's instruments in the wake of its risky orbital insertion manoeuvre on 5 July. They'll all be switched on to check they're operating correctly before the probe swoops in closer to the planet in October. It'll skim the tops of Jupiter's clouds in the hope of understanding the structure and star-like chemistry of the vast world. In particular, we want to know what lies at its very core. Once in position, it'll loop around the planet about 30 times before the intense radiation does so much damage that it no longer operates. At that point, it'll be commanded to descend into the planet's thick atmosphere and never be seen again.